During my college days at BHU, Varanasi, in the 80’s, these little ads for movies in the local Hindi dailies would exhort us to see a particular movie by exclaiming, “Maar-dhaad, naach-gaaney aur romance sey bharpoor, mahaan samaajik chalchitra. Poorey parivar key saath dekhein!” Dabangg harks back to the same era and I could repeat the slogan for this movie as well. Hurrah, the return of old-time Bollywood! 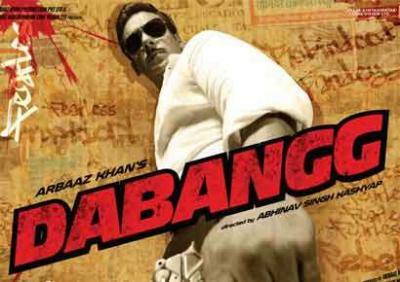 Dabangg has neither the Mumbai underworld nor the nattily-dressed NRI Vicky Malhotra (of Karan Johar fame). 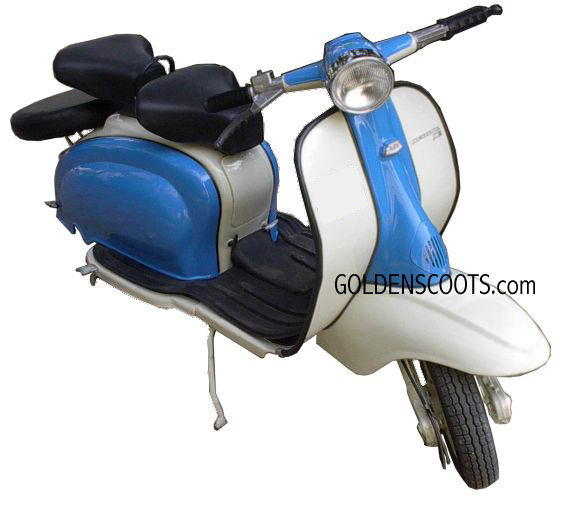 It is set in small-town Uttar Pradesh of today and has an endearingly- named chief protagonist, Chulbul Pandey. You know you are in for a rollicking time the moment Salman Khan, playing the role of police officer Chulbul Pandey, makes his entry. Kya entry hai boss! Salman breaks into the den of the baddies and proceeds to smash them to pulp, and in what style! He hoses them clean to star with and then announces, “Abhi to nahlaya hai, ab dhulai karoonga!” And what dhulai he does starting from those amazing tricks with the hose-pipe and then the good old fisticuffs. Then follows the classic scene where all the participants in this scrum are sliding around the floor thanks to the spillage of a copious amount of oil. Even during this rather hectic maar-peet, Salman breaks into a jig, dancing to the caller tune of the mobile of someone he was mauling just a moment ago! And it is Salman all the way after that. Salman fighting, Salman singing-and- dancing, Salman romancing, Salman delivering one-liners. The crowd in the multiplex where I saw the movie this morning was going berserk. Chulbul grows up with his stepbrother Makkhi (Arbaaz Khan) as his mother (Dimple Kapadia) marries Prajapati Pandey (Vinod Khanna) on the death of her husband. Chulbul thinks his stepdad is always unkind to him and hence he hates him, and Makkhi too. (But he does adore his mother.) They have an uneasy coexistence till Chulbul moves out of Prajapati Pandey’s house after his mother passes away (suffocated to death by the chief villain, we are told towards the end of the movie). The chief villain, Chhedi Singh (Sonu Sood) is an aspiring politician who goes to despicable lengths to further his political ambitions. He manipulates into Makkhi doing his dirty jobs. Like, for example, delivering a bomb in a crateload of mangoes to his mentor in politics so that he (Chhedi) could get the party nomination for the forthcoming elections. But Chhedi is ultimately bested by our Chulbul Pandey in the climax, full of blood and gore. And a bare-chested Salman! Chulbul is not only brawn and machismo, there is a romantic side to him as well. He falls for Rajjo (debutante Sonakshi Sinha) and convinces her to marry him. While she has a substantial role, the script writers, in a master-stroke, have written virtually no lines for her. What an introduction for Shatrughan Sinha’s daughter! The Shotgun who stood out in his movies by his loud acting and even louder dialogue delivery! Sonakshi manages to convey her emotions with her eyes and her body language. She has done a terrific job and her’s must rank as one of the most impressive Bollywood debuts in recent times. There are cameos by veterans like Anupam Kher, Om Puri, Mahesh Manjarekar and Tinnu Anand. And an item number by Malaika Arora- but naturally- as it is her home production. One word for the director, Abhinav Kashyap. Terrific! The way his brother Anurag Kashyap has blazed a new trail with Dev D and Gulaal, Abhinav too will go places in Bollywood. It takes a smart director to take the routine masala and whip up a lovely meal that is Dabangg. The strength of the movie is that it does not pretend being “meaningful” cinema. It knows it has just one job on hand, and the job is to entertain. And does it entertain!! It holds you enthralled. All two hours plus of it! Go watch it! Poore parivar key saath dekhein! Remember to smuggle-in a bagful of unshelled groundnuts. And enjoy scattering the shells on the floor as you munch along watching the dhishoom-dhishoom. Just as we used to in the earlier era. The dainty- and prohibitively priced- multiplex popcorns won’t do for Dabangg, you have to hear the crack of the shell collapsing between your jaws as you extricate the nuts from within. This afternoon my wife, Kiran, and I met a little angel. A little messenger of God, emanating from the Supreme Being, sent to do His bidding. This angel has told us today, without saying even one word, so much about the Supreme Being. He loves you. He is there with you. He is there in every small thing. And He is there everywhere. Our angel, Aaditya, suffers from the rare, very rare, and fatal, disease called Niemann-Pick type C1 disease. So rare that only some five hundred people across the globe have been diagnosed to suffer from it. Aadi is going to turn eight a few weeks hence, on 15th February 2009. Kiran and I enter Aadi’s bedroom and find him on his bed, wrapped-up in a quilt, staring at us with his unblinking eyes. He does not say a word, he barely makes a gesture. A little bundle of flesh-and-bones covered with pale skin. With hardly any energy left in him to acknowledge our hellos and our touches. He reacts to his father, Ravi, who sits next to him, holding his hand, caressing his cheeks. An unspoken bond between the two. So palpable. The mother, Tasneem, stands next to the bed, gazing at them. And Kiran, a little unsure of what to do, shifting her gaze among the three, the angel and the parents. Then the angel wiggles his finger and Ravi places a portable DVD player next to him and plugs in his favourite cartoon show. The angel’s eyes are transfixed in the DVD and we are signalled to vacate the room. Let the angel have his private moments. Niemann-Pick disease is an inherited condition involving the breakdown and use of fats and cholesterol in the body in which harmful amounts of lipids accumulate in the spleen, liver, lungs, bone marrow, and brain. Signs include severe liver disease, breathing difficulties, developmental delay, seizures, increased muscle tone (dystonia), lack of coordination, problems with feeding, and an inability to move the eyes vertically. There are four sub-types of the disease, A, B, C and D. And these are all fatal. Some kids do not progress from infancy while some may live into adulthood. As of now, there are no proven cures for this disease. There are some studies for new drugs going on in animals, but there is no clinical study on humans yet. The awareness of this rarest-of-rare disease is extremely low, even among doctors. You would be “lucky” if the disease is diagnosed. Maybe lucky is not the word, you are downright unlucky to have the disease diagnosed as the doctor will tell you that he can do practically nothing to cure you of it. And you live each day fearing the worst. As I look back in time, I remember visiting the hospital to greet the day-old Aadi. A little bundle of joy in his mother’s lap. Over the years I met Aadi several times. At his place or ours. At our office parties. (His father, Ravi, was a colleague of mine for several years). At the office sometimes, after office hours, when Aadi would draw pictures awaiting his dad to finish his work. Till one day they discovered something really strange. Aadi would fall down whenever he laughed. Just like that. That rang the alarm bells ringing and the parents made swift moves to have this investigated. A few months of going from one top doctor to another and then someone remarked. “Possibly Niemann-Pick disease”. The only way this could be confirmed was via a fairly complex investigation which involved the entire family traveling to a specific hospital in Delhi to give their blood samples. These samples were flown to a specialized lab in Holland for analysis. The reports confirmed the worst fears. Aadi was indeed suffering from Niemann-Pick disease. The disease was confirmed, the cure was not in sight. The clock had begun ticking, as it were, for Aadi. This was about a year and a half ago. The months which followed saw a flurry of activities. Including a trip by Aadi’s family to meet the top specialist in the disease. All the way to the US. He too could not offer any course of treatment. He could not, none is available still. Multiple doctors, multiple advices. But no sure route for recovery. But lots of prayers. Lots and lots of them. Aadi’s condition continued to worsen. Some four months ago there was a rapid decline in his health when Aadi lost ability to move, to speak, or even to eat. Things were rapidly going downhill. Not that nothing else was happening in the meanwhile. Aadi’s parents, Tasneem and Ravi, had decided to put up a fight, a very strong fight. They were not going to give up easily. No way. And the larger extended family of the couple spread across continents joined in. It was not Aadi’s battle alone, not his parents, but all of the family and friends. The resolute and heroic manner in which the family is dealing with the situation is inspirational. For example they fought tooth-and-nail to get the approval for, a hitherto unapproved, stem-cell transplant therapy. They have extended the battle beyond Aadi as well. Spreading awareness about the disease, connecting with parents with similarly suffering kids, even financially supporting some of their treatment. This is stuff for some other time, maybe. As we leave Tasneem and Ravi’s place, we tiptoe into the room where Aadi is asleep and say a quiet bye to the angel. We drive back home wishing for that one miracle which would cure Aadi. But then, I wonder, isn’t Aadi himself a miracle. A miracle which has made people draw upon inordinate reserves of strength from within, a miracle which has brought together strangers across continents. Yes, our angel, indeed is a miracle. 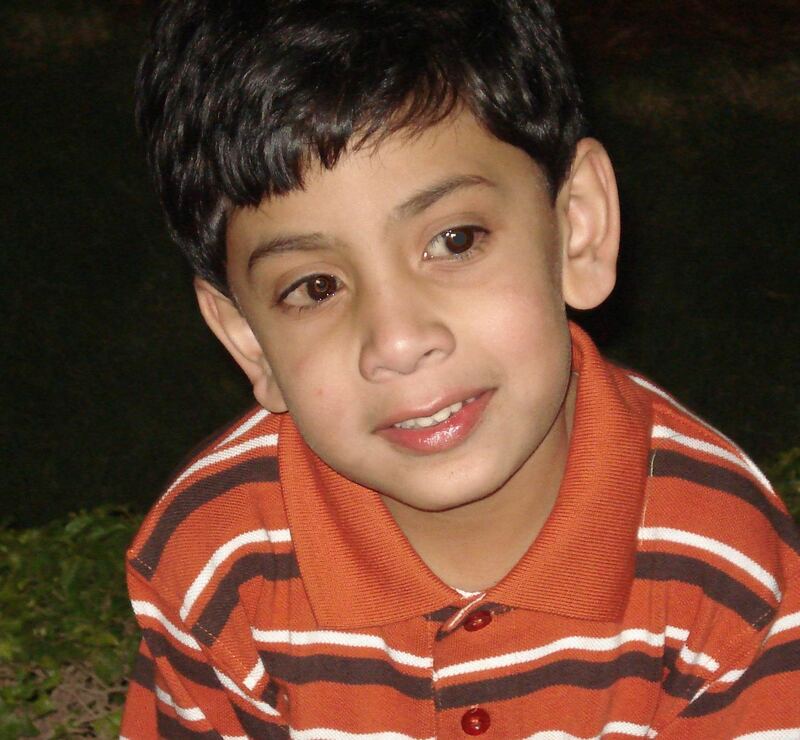 PS: I have just returned from a memorial service for Aadi held this evening at his Church. He passed away four weeks ago, on 12th August. This piece you just read was written on 3rd January 2009, just after a visit to Aadi’s. Kiran and I had been meeting Aadi right since his birth, we first met him when he was barely a day old, at the hospital. We were troubled now seeing Aadi in this condition. But we were also impressed with the way Aadi’s parents, our friends Tasneem and Ravi, were handling the situation. This piece was written as I wanted to capture my thoughts and post it on my blog. Somehow I never got around to doing it. Tasneem called me last week to tell me that she wanted me to write something on Aadi. And she wanted me to read the piece at the memorial service, I offered her the same piece. And I told her that I would not want to edit it or even update it. So what you are reading now was written twenty months ago. PPS: This is a rather unusual piece on my blog. But I am posting it here as I want you to know about the Niemann-Pick disease. To know about how Tasneem and Ravi braved this ordeal. And for you to know how lovely this child, Aadi, was. You are currently browsing the Santosh Ojha's Weblog blog archives for September, 2010.